Chef Monday “Monte” Agho shows off one of his signature dishes: Mississippi Pride Catfish. Monday “Monte” Agho never intended to open a restaurant when he arrived in America in 1975. At that time, the young Nigerian had his sights set on a finance degree from Jackson State University with the ultimate goal of a doctorate to enter the hallowed halls of academia. However, Agho needed a little pocket change, so he started washing dishes at a local Mexican restaurant named El Palacio. After graduating from the ranks of dishwasher and busboy, he became a waiter. One day, when the boss was out, Agho went to work in the kitchen, because he didn’t like the way the chips were disheveled on the plate. Customers commented on how excellent his food was, and he made his way to head of the kitchen. Now, nearly 30 years later, Agho, 57, presides over Monte’s Steak & Seafood Restaurant (1855 Lakeland Drive, Suite N10, 601-362-8182), but he has made many stops between El Palacio and his eponymous restaurant. Longtime Jackson residents will remember a old favorites like Sundancer and Colours. 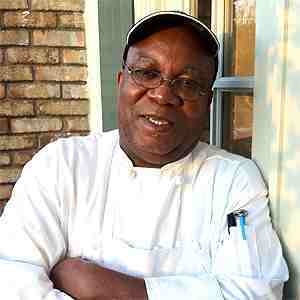 Those restaurants, in addition to Amerigo and the Country Club of Jackson, all helped Chef Agho hone his craft. Agho opened the original Monte’s on Terry Road in 1991, but recently started to re-craft his menu. I sat down with Chef Agho to see what changes he had in mind. It came out of necessity. When I came to school, I was looking for something to do to make extra money. I started as a dishwasher, and then I became a busboy, then a waiter. Are any of the places you worked at still around? Some are, but the first place I worked at, El Palacio, is not. … It was in the late ’70s. When I was a waiter, you got your tips every day. Being in college, I spent it all on partying. At the end, there was no money in your paycheck. I wanted money in my paycheck, so I started working in the kitchen. How did that evolve to what you have now? I liked the Mexican restaurant. I went to the Hilton and started cooking over there. I then came to the Sundancer. When I came to the Sundancer, it was when I really got interested in cooking. It was owned by a group of seven investors. Before the 1979 flood, there used to be a place here called Bernard’s. When his restaurant was wrecked during the flood, Bernard left there and came to the Sundancer and took it over. He turned the restaurant around. I saw there was money to be made, so I started following him to learn his trade. He knew what he was doing, and I wanted to learn how he was doing it to get the place open. From there, I started to work. I never really thought I could open my own restaurant. I told myself, “I will learn what he’s doing and when I finish school, I will go back home, and I’ll be able to start an American diner.” … From then, I started paying attention, and I was able to learn how he ran a business. Before I finished school, I became a chef over there. I guess I concentrated so much more on learning the trade that I became a chef. Does the restaurant have any community-service involvement? I do lots of support of charities around here. We have a charity we fund here called the Edo Heritage Union of Mississippi. It’s a nonprofit we finance here for people back in Nigeria. We give to the community here, and we also go back home and help a hospital back home. We have a women’s ward there—we give them beds, mattresses. We adopted a family of four from Louisiana after Katrina. We give things to the Red Cross and the American Cancer Society. What’s your best dish, one you can cook with your eyes closed? There are so many I can cook with my eyes closed because I make them all myself, but I like my blackened red snapper and my blackened steak. It’s so good that I call it voodoo. People come back and have to have that for dinner. 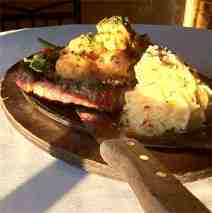 What makes you different from other Cajun and Creole restaurants? I’m authentic Cajun. What I mean by authentic (is I cook) with the Cajun flair. People say that they’re Italian with an American flair. I’m authentic with a Cajun flair. When you look at gumbo, it originally came from Africa. We call it okra soup. When you use tomatoes, we don’t call it Creole, we call it stew. There are certain ingredients we use to make that here.